On Friday, April 22, a beautiful new Japanese garden was dedicated on the Kaneko Commons grounds. This Tomodachi "friendship" Garden is the culmination of a year of planning and production. It was made possible by a generous donation from a long-time Tomodachi Program participant, as well as two other family members. 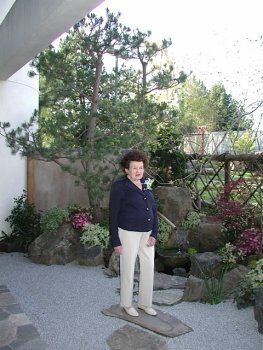 Margaret Bagley, who has participated in the Tomodachi "friendship" program since TIUA was established in 1989, made a significant donation to Willamette University to establish the garden in honor of her husband, Bruce, who passed away in 2009. In addition to being the longest running Tomodachi program participant, Margaret also promotes TIUA and its many programs as well as recruiting many of her friends and colleagues to join the Tomodachi Program. Mr. Shinji Nagano (TIUA'92), who lives in Sendai and recently experienced the Eastern Japan earthquake and who is from Kobe, watched the baseball game of Rakuten vs Nippon Ham in “Hottomotto Field Kobe” on April 22, 2011. Shinji's home in Kobe was totally destroyed in the 1995 Kobe earthquake. During that year, he visited the same baseball field many times to cheer on the Olix baseball team, which won the season with the slogan “Ganbaro (Let’s work hard) Kobe.” “This time, from recovered Kobe, Rakuten (which is based in Sendai) will send hope to Tohoku (Northeastern) region” said Shinji while watching the game. 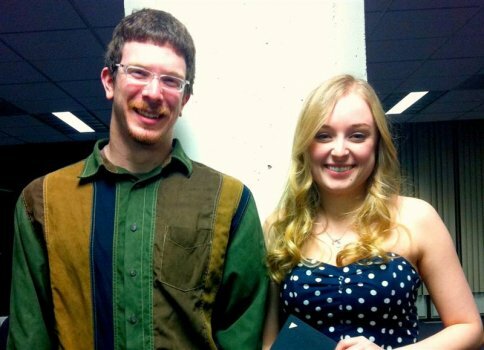 Congratulations to Kelsey Ledford and Brent Jones (both WU'11), recipients of the campus life award for Greatest Contribution to the Willamette/TIUA Community. This award recognizes students who have shown exceptional effort in fostering relationships between Willamette and American Studies Program (ASP) students, especially in the area of programming that specifically targets Willamette/TIUA collaboration as well as ASP student inclusion in the Willamette community. The award was given out at the Campus Life Honors and Awards Ceremony held at Willamette University on April 21. This ceremony is a Willamette-wide event honoring students who made outstanding contributions to campus life across the university.